Those of us who have struggled to learn a new language are always looking for any new techniques that will make the unfamiliar sounds and grammar easier to remember. 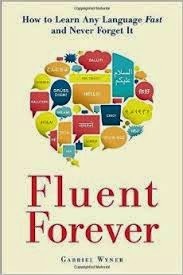 The new book Fluent Forever by Gabriel Wyner shows the process that the author has used to master 6 languages. The system that he recommends is one I've never used in regards to language learning, but would be anxious to try: the flashcard system. Most of us probably have vague memories of using flashcards in elementary school to remember and test ourselves on various concepts. According to the author, the concept of a Spaced Repetition System (SRS) using flashcards is key to learning a new language, except now there is a more high tech option. The author gives step-by-step instructions for creating a set of "old school" flashcards using actual cards and a file box, while also pointing out an electronic version Anki. While the concept of flashcards (whether on paper or electronic) might not fill the prospective language student with excitement, the key to making the system work is to make each card personal to the user. Research shows that our memory for images is much stronger than that for words or sounds, so associating a picture that is meaningful for you and will trigger your memory is essential. Also, the general process of creating a personalized flash card for each sound, word, or grammatical concept you need to remember will help to reinforce the idea. The book also includes information about how to set up your own flashcard system for maximum retention of concepts: namely, how often to review both new and old words so that they will be cemented in your memory. There are numerous helpful appendices at the back of the book, including recommended books for specific languages, an International Phonetic Language guide, and the 625 words the author feels are most important to start with when learning a new language. I thought this was a very fascinating and inspiring book for those who want to learn a new language. The very specific and step-by-step instructions for setting up the SRS make the entire process seem manageable and achievable. I am anxious to try out some of the author's ideas to see if I'm at least able to get a basic understanding of a new language. Disclaimer: I received a copy of Fluent Forever from Blogging for Books in exchange for this review.